Ask for a trainer’s qualifications and experience. Many years ago, a dog's life in the city was quite good. I lived on a housing estate in the '80's and most dogs roamed their patch, lay outside their gates and generally lived a more natural life style than they do today. Society has changed in their attitude towards dogs and dog owners. Since the introduction of the Dangerous Dog Act - which was the most ill thought out piece of rubbish that I have ever read, but that's another article!- things have altered dramatically. You are now responsible for your dog and his actions. Society now demands that you keep your dog under control AT ALL TIMES. Most Councils are considering banning dogs from public parks, or at least keeping them on a lead. The dog is not allowed to bark out of control or continuously disrupt your neighbours' leisure time spent in their gardens. So, if you decide to become a dog owner then you must become a responsible one. Now more than ever do you need to train your dog. You must be able to call your dog back to you at all times - the law now demands it. You must socialise your dog if you want to take him out with you on day trips or holidays and now with the Pet Passports, being able to control your dog is a necessity. When you decide to have a dog, you must think it through very carefully. The next 10 - 15 years of your life will be shared with this lovely companion. The most important things you must consider is enrolling either at a Dog Training Club or have individual lessons. Start as soon as you can and the pleasure and pride you will have from owning a well trained dog will be ten fold. I believe that the dog must be treated with the utmost respect. If we can treat each other with respect, then why not a companion who communicates in a different way. This also applies to all animals. So many times I see cruelty and dismissal. Rejection is terrible. When you walk into your home and the dog jumps at you to say "Hello" so many times do I see the pain of rejection. You bellow "Get Down" or even smack the dog. You are wrong. If a person you loved shouted at you and ignored you, you would soon become withdrawn and confused. Stop, take time just to say hello to this lovely friend who is giving you such a greeting. I hate the abuse of the Control Freak or the moody and nasty individual who takes sick satisfaction out of bullying and cowering a dog for no reason apart from their own nastiness. The Control Freak has to show power by constantly being overbearing and keeping the dog in a constant state of fear. Yes, these people do exist. If they cannot inflict their abusive and cruel ways on other people or children, then the closest thing to man is the Dog! There is many a cry and squeal of pain that is repeatedly heard from a neighbours dog that is repeatedly ignored. There are so many sad eyes in a backyard, that live in stench and squalor, hardly fed, never brushed, tied to a pole. THIS SILENT NATION SUFFERS THE MOST HORRENDOUS CRUELTY, NEGLECT AND ABUSE THROUGH NO FAULT OF THEIR OWN. My name is Janet Wesley. I have trained dogs and handlers in puppy management, obedience, agility and behavioural problems for the last 30 plus years. I have bred GSD’s since 1977 and have bred and trained dogs that have qualified Crufts. I have trained my own dogs to Test “C” Obedience. I have managed my own Dog Training School since 1972 and I train and manage a dog display team. I have trained Security dogs, P.A.T. (Pets as Therapy) dogs, school visiting dogs, and hospital dogs. I am qualified with the British Institute of Professional Dog Trainers. The first thing you need to know is how your dog learns. Your dog learns the same way that we do. Good experiences and bad experiences. Pleasure and pain. It is your responsibility to treat your dog with tolerance, patience, kindness and love while you are training him. If you praise him and reward him for an action, he will repeat that action. If you hit or scold him for a certain action, he will stop doing the action out of fear, but he will only remember the fear and can forget the action - that is why they often repeat the action again. Every animal responds in a more positive way if taught kindly and rewarded with treats. One of the saddest sights I have seen is when a hand is extended to say hello to a dog and the poor thing cowers and trembles because he has been hit repeatedly. The hand to him is an instrument that punishes him and hurts him. This makes me very angry. Everyone at some time is firm and at times will smack their dogs, but to inflict terror and fear on any animal is totally unacceptable behaviour and should be punished by the Courts. So, back to basic training. Find yourself a good dog training club. Contact the Kennel Club and they can send you a list of registered clubs in your area. Shop around, as some clubs are better than others. 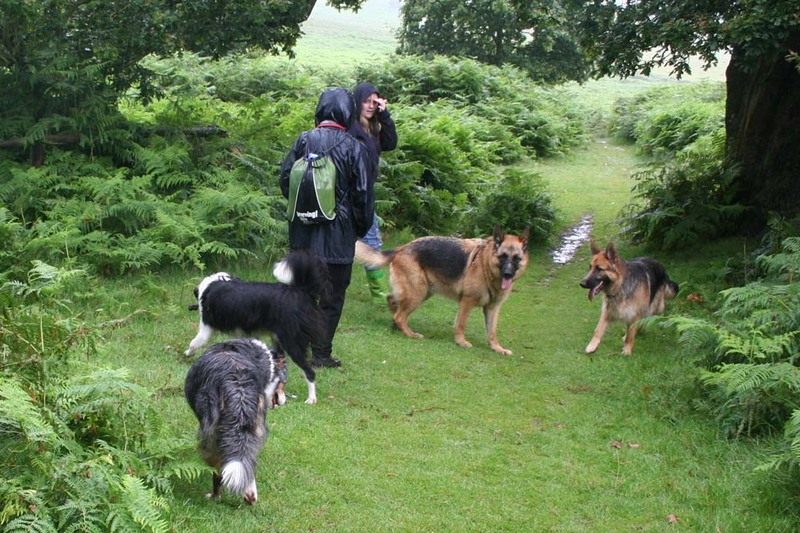 An outdoor school is preferred, as outside is where your dog needs to be obedient. Indoor training can work, but only if the numbers are small and the class controlled. I have found that indoor clubs can be where the dog learns nothing because of the noise, dogs barking, people shouting, dogs fighting, puppy’s frightened and cowering, the trainers shouting louder and louder to be heard, handlers dragged around the hall by dogs so overcome that they are dragging their handlers out of the door, ABSOLUTE BEDLAM! The dogs and handlers so exhausted and traumatised that neither can remember what they have learned and dreading the next lesson! You have been warned! With your puppy, try to find a puppy class where he can socialise and play. This will help you and your puppy. Train your dog every day as he will learn more quickly and will soon be moving up to the top of his dog training class. The dog will only be as good as the effort you put in. If you don’t train him between classes then he will not progress. Do not blame the Dog Training club! A point to remember - Ask for a trainer’s qualifications and experience. DOG TRAINING CLUB or trainers like myself, who are only too happy to help with most problems.